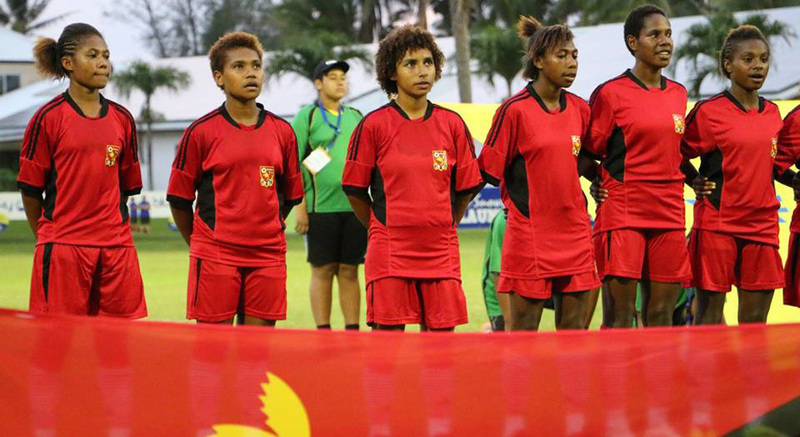 Papua New Guinea came from behind to beat host nation Cook Islands 2-1 on Match Day 4 of the 2016 OFC U-17 Women's Championship in Cook Islands. This makes it two victories from two matches after they belted Vanuatu 7 - 1 in the previous match. The match was played through continuous rain and wind at the CIFA Academy, adding to what Papua New Guinea coach Margaret Aka described as a difficult match for her side. “We had to play really well this afternoon. Cook Islands came out and defended very well, we knew they would and that it would be tough, so I am really happy for the girls,” Aka says. “We weren’t able to play at a fast pace because of the way the Cook Islands defended. The CIFA Academy seemed to rise as one when Cook Islands captain Susan Williams headed home a corner on 10 minutes to score the host nation’s first goal of the tournament. From there the game flowed from end to end, with the wet conditions making it hard for both teams to maintain possession of the ball. Cook Islands shot-stopper Dora Iripa pulled off a couple of athletic saves to keep her side ahead, but was helpless to stop Belinda Giada’s effort in the 39th minute which locked scores at 1-1. Following a goalmouth scramble off a corner kick Giada found space and curled the ball into the goal despite the presence of several Cook Islands defenders. Only five minutes later Giada was on hand once again to give her side the lead, drawing Iripa out of her box and finishing well. Up 2-1 heading into the second half Papua New Guinea had most of the ball but continued to be turned away by a determined home side who scrambled well to disrupt forward movement. Mercedes Hapoto had the best chance to put the game out of reach for Papua New Guinea on 11 minutes, but her header off a corner kick pinged off the crossbar. In the fifth minute of added time Cook Islands were awarded a free kick and given the chance to steal a draw on the last play of the game. The ball came in with power and looked bound for goal, but in the end curled wide of the goal as the fulltime whistle sounded in the background. The loss leaves the Cook Islands with an uphill battle to try and make the semi-finals, but coach Tuka Tisam remains proud of the effort his team put in. “PNG is a tough team, but I thought my girls played really well,” Tisam says. “We could have been better in attack, but there were some improvements from the first match. All teams have a rest day tomorrow before action resumes on Monday with simultaneous kick-offs at the CIFA Academy and Takitumu School.